As the men of the Worcesters waited on their vehicles for the order to move it became evident that all was not going to plan. Rumours, purveyed chiefly by Sappers who could not resist going down to the bank to inspect their proposed bridge site, told lurid and exaggerated tales of storm boats fouling in weeds and on sandbanks, and of light machine guns in enfilade positions on the island in the river, while the unmistakable sound of spandau fire supplemented by something heavier, probably 20mm. canon, could be heard in increasing volume. These rumours were not without a certain amount of truth. The aerial photographs had been misinterpreted by the experts who misjudged the depth of the river. As a result some of the storm boats had grounded and only a small number of 5th Wiltshires had been able to make the north bank. The 4th Somersets had reached the island close to the north bank but were having trouble with a narrow channel on the enemy side of it which the photographic experts had said was dry. It was, in fact, very wet and exceedingly muddy. Major-Gen. Thomas now ordered Brigadier Mole to attempt a crossing over the damaged road bridge by the 1st Worcesters. 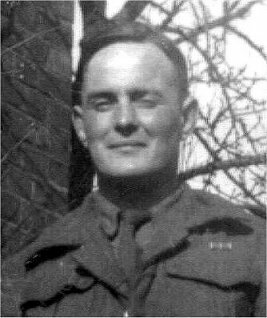 Major Gibbins, commanding ‘A’ Company, then ordered 9 Platoon, lead by 2/Lieut. Bill Jennings, to make an attempt across the bridge which was still passable on foot. The men of 9 Platoon debussed from their vehicles and proceeded to the area of the bridge. As the other Platoons disposed themselves in the buildings and alleyways near the bank the irrepressible sappers arrived once more, this time with a bulldozer, and began to shift the rubble and prepare the bank for a Class 9 Bridge. The resultant noise drew a shower of light mortar bombs from the other side, temporarily discouraging them and causing them to withdraw. Dusk had now fallen by the time 9 Platoon clambered on to the broken bridge and moved warily across it. 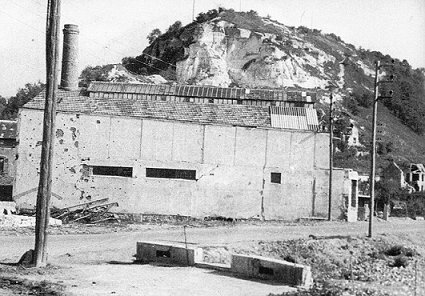 Captain Jock Bannisters mortar platoon provided covering fire with 3 inch mortars. As the Platoon Commander (2/Lieut. Bill Jennings) reached the northern end he set off what at first he thought to be a small mine but which turned out to be a number of booby trapped egg grenades. 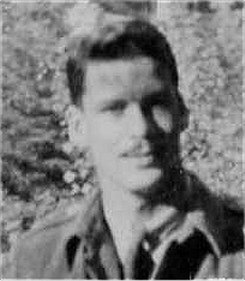 He was quite severely wounded in the hand and Private Len Treadgold was shot and fell into the river (he was recovered but died two days later of his wounds). Lieut. 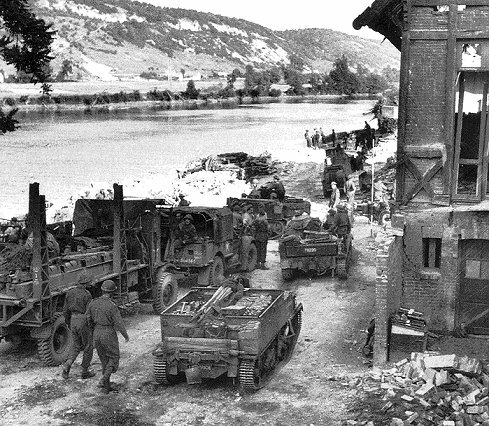 Jennings managed to get his Platoon back despite the hail of machine gun fire which swept down the bridge. 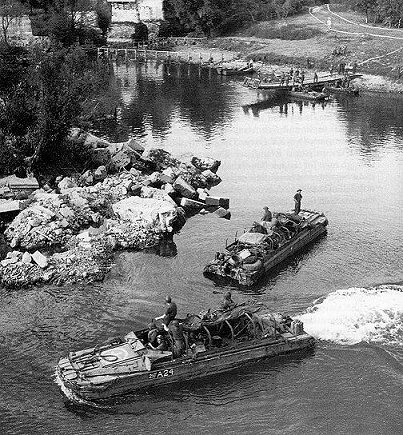 Further attempt to cross by the bridge promised to be expensive until the enemy machine gun could be eliminated. There was an interval whilst various projects, such as turning one of Worcesters 6-pounder guns on it by the light of 2-in. mortar flares, or obtaining the assistance of an S.P. gun (a 3-in. howitzer on a tank chassis) were considered; these however had to be abandoned owing to the possibility of endangering the 5th Wiltshires who were now gradually managing to get across. 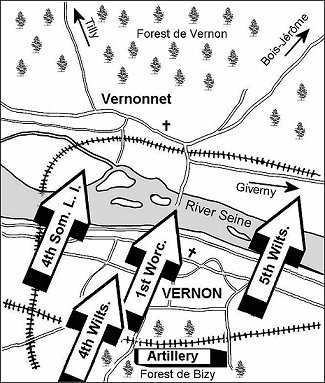 Lieut.-Col. Osborne-Smith now decided that the bridge must be rushed despite the mines and machine guns, but was suddenly ordered by Brigade HQ to "stand fast" as the 5th Wiltshires were to take on the opposition and open up the bridge from the far bank. ‘A’ Company retired to the shelter of the houses, had a hot meal and waited expectantly for the sound of battle opposite to tell them that the Wiltshires were engaging.